Bitter cold weather has arrived, and a bit too abruptly at that. How are you going to stay stylish through the frigid Erie winter? Dressing for sub-freezing temperatures and looking good at the same time is a challenge. Sure, you can throw on a bunch of layers – large down coat, blanket scarf, and warm gloves – but more often than not, you'll look like something out of the tundra and not fashionable. I'm here to let you know that there are ways to stay on trend within the confines of comfort and practicality. Read on to learn what pieces you should add to your wardrobe to achieve this sense of balance. Layering is nothing new, but winter layering requires more thought and skill to avoid adding too much bulk to your frame. Thick, chunky layers are unattractive, uncomfortable, and will have you looking larger (which no woman ever wants). Instead, cover up with thin layers. For example, a striped turtleneck under a denim button-down under a cardigan is a great casual day look. Another option would be a long-sleeve thermal or button-down plaid top under a lightweight sweater, topped off with a blazer. Invest in a few pairs of thermal tights and leggings. This will save you if you're wearing a dress or skirt to the office. They also work under straight- or wide-leg pants without adding too much bulk. A Statement Coat is one of the easiest ways to pull off a stylish look while pushing through the winter winds. When I say "statement" coat, I'm going for a bold color, some sort of trim (think: leather or faux fur), or an asymmetrical cut. The robe coat is a perfect example. The cut – akin to a wrap coat – is reminiscent of a bathrobe and all attending coziness. 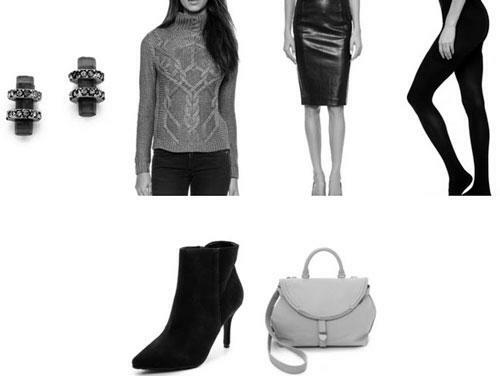 Asos and Vince Camuto carry some of my favorites and they are affordable (between $150-$250). If you feel like splurging, Trina Turk makes a gorgeous, merlot-colored version of the robe coat. Colored fur – a quintessential outerwear look – is also trending this season. Wear a cropped-style fur coat that hits just below your hips so as not to be too overwhelming. These coats often come with a hefty price tag, but they are worth it. Topshop and BB Dakota have some great options for under $200. WAYF also makes a pretty, pale blue, open-front jacket for only $125. Unreal Fur, Rebecca Minkoff, and Diane von Furstenberg carry more splurge-worthy options. Texture. A simple, white sweatshirt or structured top has new meaning when there is texture involved. Choosing a top that is quilted, velvet, felted, or has leather or fur accents is one of the easiest ways to stay on trend and comfortable during the winter. For the holidays, I love a metallic, cable knit sweater. It has the right amount of shine that offers a glam appearance without being excessive. Bouclé is another fabric with a thick, somewhat rough texture. A bouclé jacket or shell creates a classic, timeless look. Mixing textured pieces is another way to punch up your winter style. Try pairing a leather pencil skirt with a plaid, flannel button down, and booties. Accessories should never be underrated when it comes to winter style. A stunning hat or stylish gloves have the capability of pulling an outfit together. What's more, they will keep you warm. A slouchy beanie, wide-brimmed wool hat, or faux-fur trapper will adds more personality and flare to any outfit. As for your mitts, short gloves make for a nice casual look while going with a longer, elbow-length glove makes more of a statement. Instead of the traditional black, have some fun. Try a merlot- or mustard-colored leather glove. Footwear is essential. If your feet are frozen, game over. Investing in a pair of boots that will take you from home to office to grocery store or wherever you may be going is a must. The Sorel brand is a great option. These boots are stylish, sturdy, and weather-proof. My favorites are the Tofino or Joan of Arctic styles, which are taller, lace up, and come in different colors and trims. Thankfully you don't need to look too far to find any of these great winter looks. H&M in the Millcreek Mall has lots of options, and, as for a great statement coat, try Macy's or TJ Maxx; online, take a look at Piperlime and Keaton Row. Lili Morton can be contacted at LMorton@ErieReader.com, and you can follow her on Instagram @Morton_Street and find her online at KeatonRow.com/LaLili.